Milford, Ohio – International TechneGroup Incorporated (ITI) will be at two important automotive conferences in early November to discuss the benefits of validating the 3D design data that drives the automotive industry. On November 3rd the CIMdata PLM Road Map™ event for automotive industry executives and PLM practitioners will be held at the Inn at St. John’s in Plymouth, MI. ITI’s CAD Validation Specialist, Doug Cheney, will present a PLM vignette “Driving Confidence into Your Supply Chain with 3D CAD Model Validation”. ITI has sponsored the event for the past two years. “This is as an excellent networking opportunity for not only automotive, but the heavy equipment industry. Both industries face similar pressures of cost, competition and production schedules," stated James Flerlage, EVP Business Development with ITI. In Southfield, MI on November 4th the automotive industry will see the return of the COE Automotive Industry Workshop at Lawrence Technical University. COE began over 30 years ago as the “CATIA Operators Exchange”. The event was halted in 2008 during the automotive industry crisis. Today Dassault Systemes has rebranded the COE group as “Community of Experts” and brought back the once popular automotive event. MBD is the next revolution in CAD/CAM/CAE. MBD uses 3D CAD models and technical data packages (TDPs) as the single source for all design information, eliminating the need for 2D drawings. 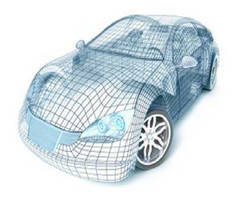 Over the past five years, ITI has been active in the Automotive Industry Action Group (AIAG), and has witnessed a surge in MBD initiatives among automotive manufacturers and suppliers. “Once adopted only by the Aerospace and Defense industry, MBD is now gaining traction in other industries, like auto. We look forward to both of these events in Detroit, where we can present the critical message of 3D CAD model quality and validation as part of the MBD process,” added Spurgeon.